Visualizing Posthuman Conservation in the Age of the Anthropocene. Amy D. Propen. The Ohio State University Press, New Directions in Rhetoric and Materiality Series, 2018. Available from The Ohio State University Press and amazon.com. Download the promotional flyer here. Informed by a visual-material rhetorical approach, this book asks: What does it mean to act with compassion and practice conservation in an age of technoscience? To address such questions, this book merges a visual-material rhetorical framework with ideas about compassionate conservation and the posthuman, applying these ideas to three cases that involve the impact of ocean plastics on vulnerable seabirds; the debate about seismic testing and its potential impacts on marine species; and the rhetorical implications of conservation maps created by tracking the movements of marine species over time and space. In these cases, technologies of visualization, from photography to GPS tracking, play a prominent role in arguments to protect threatened marine species. Together, the cases in this book help conceptualize a new visual-material, posthuman environmental rhetoric, informed by an ethic of compassionate conservation. Rhetoric and Communication Perspectives on Domestic Violence and Sexual Assault: Policy and Protocol Through Discourse. Amy D. Propen and Mary Lay Schuster. Routledge Studies in Technical Communication, Rhetoric, and Culture, 2017. This book brings rhetorical, legal, and professional communication perspectives to the discourse surrounding policy-making efforts within the United States around two types of violent crimes against women: domestic violence and sexual assault. The authors propose that such analysis adds to our understanding of rhetorical concepts such as kairos, risk perception, moral panic, genre analysis, and identity theory. Overall, the goal is to demonstrate how rhetorical, legal, and professional communication perspectives work together to illuminate public discourse and conflict in such complicated and ongoing dilemmas as how to aid victims of domestic violence and sexual assault, and how to manage the offenders of such crimes—social and cultural problems that continue to perplex the legal system and the social environment. Design, Mediation, and the Posthuman. Edited by Dennis Weiss, Amy D. Propen, and Colbey Reid. Lexington Books Series in Postphenomenology and the Philosophy of Technology, 2014. Though the progress of technology continually pushes life towards virtual existence, the last decade has witnessed a renewed focus on materiality. Design, Mediation, and the Posthuman bears witness to literary theorists’, digital humanists’, rhetoricians’, philosophers’, and designers’ attention to the crafted environment, the manner in which artifacts mediate human relations, and the constitution of a world in which the boundary between humans and things has seemingly imploded. The essays reflect on questions about the extent to which we ought to view humans and nonhuman artifacts as having equal capacity for agency and life, and the ways in which technological mediation challenges the central tenets of humanism and anthropocentrism. Discussions of the posthuman already have a long history in fields like literary theory, rhetoric, and philosophy, and as advances in design and technology result in increasingly engaging artifacts that mediate more and more aspects of everyday life, it becomes necessary to engage in a systematic, interdisciplinary, critical examination of the intersection of the domains of design, technological mediation, and the posthuman. Design, Mediation, and the Posthuman thus brings diverse disciplines together to foster a dialogue on some of the significant technological issues pertinent to philosophy, rhetoric, aesthetics, and science. Locating Visual-Material Rhetorics: The Map, the Mill, and the GPS. Amy D. Propen. Parlor Press, 2012. Locating Visual-Material Rhetorics works to illuminate a more holistic understanding of visual rhetoric by better accounting for the material and spatial components of visual rhetorical artifacts. Using three cases that focus on the rhetorical work of parks, maps, and mapping devices like the GPS, it examines in depth, and in several contemporary settings, the value of a rhetorical approach that understands visual rhetoric as specifically concerned with studies of space, the body, and materiality. Together, the cases in this book help conceptualize a visual-material rhetoric that emphasizes rhetoric’s influence on the body and its ability to function in the service of advocacy. Order from Parlor Press and Amazon.com. 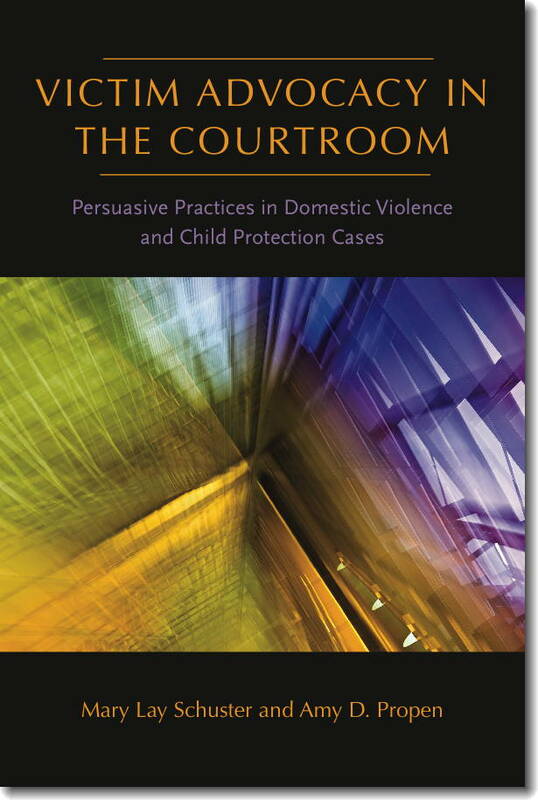 Victim Advocacy in the Courtroom: Persuasive Practices in Domestic Violence and Child Protection Cases. Mary Lay Schuster and Amy D. Propen. Northeastern University Press, 2011. Victim Advocacy in the Courtroom focuses on the rhetorical practices that shape, perpetuate, or disrupt the processes by which legal decision-making is understood and carried out. Through interviews with judges, victim advocates, and guardians ad litem (GALs), as well as courtroom observations and textual analyses, the authors discuss how victim advocates and GALs work within and against the normative structures of the court to exercise power and recover the otherwise marginalized voices for which they advocate. Order from University Press of New England and Amazon.com.